In order to play the video, I’m using TCPMP. It supports a wide range of codecs and formats, and it’s been able to handle almost everything I’ve tried. 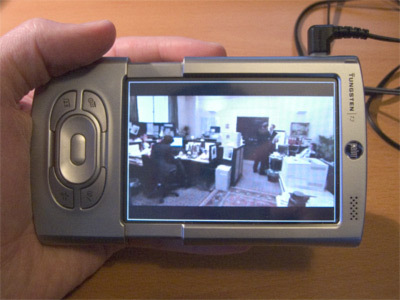 Upscaling in the player is not smooth, so the video should be of a size to fit into the screen area (either 480 pixels wide or 320 high, depending on the source aspect ratio). I only have a 128 MB SD card on which to store the video. The more intensive the processing requirements, the less time the batteries are going to last. With that in mind, I’ve found that I can encode a 30 to 45 minute TV episode to fit within the space available with acceptable results. I’ve tried two-pass encoding, but haven’t really seen much improvement over a single pass—and it takes twice as long. With these settings, a 25-minute piece uses about 65 MB, whilst 45 minutes needs 115 MB or so. The quality is tolerable, although some artifacts are noticeable in the background. Speech is good, but music exhibits the characteristic warbling of a low-bit-rate MP3. The encoding was approximately real time (i.e. the encoding time was the same as the source length) on my Ubuntu desktop (Pentium 4 2.6 GHz), and took only slightly longer on my iBook running OS X (PowerPC G4 1.2 GHz). I’m going to have to pick up a larger SD card and try to encode things at slightly better quality. With a bigger card, I’ll also be able to try transcoding some full-length films.